Lymphedema is chronic swelling of a body part, most often the extremities. Lymphedema is an accumulation of protein rich fluid in the superficial tissue spaces. This protein rich fluid contains only a small % of water. Lymphedema usually affects only one extremity. If both extremities are involved, the swelling will be asymmetrical. It may also occur in the fact, the trunk, the abdomen or the genital area. There is no known cure for Lymphedema at this time. If Lymphedema is left untreated the condition will progress and further complications, such as ulcers, may occur. Lymphedema is classified as either primary or secondary. Primary Lymphedema is caused by congenital malformations of the lymphatic system and may be present at birth or develop later in life, often during puberty or during pregnancy. Primary Lymphedema usually affects the lower extremities but may also present in the upper extremities. Secondary Lymphedema is more common and often the result of surgery or radiation therapy for cancer. Surgical procedures in combination with the removal of lymph nodes, such as mastectomies or lumpectomies and/or radiation of Axillary lymph nodes, are a very common reason for the onset of Secondary Lymphedema in the United States. Other causes may include (but not limited to): trauma, infections, thyroid complications, abnormal deposits of fat tissue and/or circulatory difficulties: Chronic Heart Failure (CHF), Deep Vein Thrombosis (DVT), phlebitis, and severe venous insufficiencies. Symptoms and stages of Lymphedema? Stage 0 (predisposed)– People who have had breast cancer and cardiovascular surgeries are at a greater risk for developing Lymphedema. Education and prevention information is crucial for these patients. Stage I (spontaneously reversible) – Lymphedema is defined by present swelling that may be temporarily reduced by simple elevation of the limb. Without proper treatment however, lymphatic fluid will continue to accumulate. 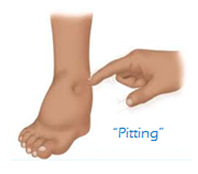 “Pitting” is an indicator of protein-rich fluid accumulation. Stage II (spontaneously irreversible) – With the accumulation of protein-rich fluid, which is seen with the presence of “pitting”, the affected tissue will progressively harden, if not addressed. This condition is known as lymphostatic fibrosis and it marks the second stage of Lymphedema. Stage III (lymphostatic elephantiasis) – Consists of other complications such as fungal infections, advanced hardening/skin changes and very often an extreme increase in volume of the swollen extremity. Since there is no known cure for Lymphedema at this time, the goal of therapy is to reduce the swelling and to maintain the reduction. For the majority of patients this can be achieved by the skillful application of a Complete Decongestive Therapy (CDT) Program, which is safe, reliable, and non-invasive. CDT is comprised of four components: Manual Lymphatic Drainage (MLD), Exercise or Physical Activity, Compression/Bandaging/Garment Therapy, and Skin Care. Manual Lymphatic Drainage (MLD) – this extremely relaxing, gentle manual technique increases the activity of certain lymph vessels and manually moves interstitial fluid. A series of MLD treatments, combine with the other components of the CDT program, will decrease the volume of the affected extremity. Exercise or Physical Activity – a customized exercise program is designed by the therapist for each patient. Exercises should be done intermittently throughout the day, especially during long periods of sitting (travel, TV, etc.) or standing. Do not sit or stand for more than an hour at a time. Decongestive exercises are very important. Exercise helps to support the effects of our bodies joint and muscle pumps (contractions) and should be performed by the patient wearing the compression bandage or garment. Vigorous movements or exercise causing pain must be avoided. Exercises should be performed slowly and with both, the affect and non-affected extremity. . Deep abdominal breathing is also important. Deep breaths aid in the transport of lymphatic fluid from the lower portion of your body and trunk. Compression/Bandaging/Garment Therapy – the elastic fibers in the skin are damaged in Lymphedema. In order to remove and prevent accumulation of fluid it is necessary to apply sufficient compression to the affected extremity. Compression therapy also improves the function of the muscle pumps, helps to reduce fibrotic (scar) tissue and promotes both venous (vein) and lymphatic return. During the first phase of compression therapy short-stretched bandages are applied. Short-stretch bandages (NOT an “Ace” bandage) are used between MLD treatments to prevent the re-accumulation of the lymph fluid which has been moved out of the extremity during the MLD session. Once the extremity is decongested, the patient then wears a compression garments throughout the day. In some cases it may be necessary for the patient to apply additional bandages at night or for travel. Compression garments vary in form and compression strengths. Each garment must be specific to your needs and your body. Compression garments should be measured by a professional. To have the maximum effect, garments must be worn everyday and replace every ~6 months. Skin Care –the portion of the skin affected by Lymphedema is very susceptible to infections and is usually very dry. A low-pH lotion, free of alcohol and fragrances, should be used to maintain the moisture of the skin and to avoid infections. Cetaphil and Eucerin are two great lines of skin care products. Take extra precautions with cuts, wounds, scratches and bug bites. A Triple Antibiotic ointment should be used regularly until the area is healed. If you are experiencing pain, redness, heat, or infections in your affected extremity promptly consult your physician for proper treatment. Whether you are planning a vacation or a business trip there are some important facts you need to know about Lymphedema and traveling. For instance, always have a written prescription for antibiotics available in case of an emergency. Airplane – Lower atmospheric pressures and the adjustment of cabin pressure on the airplane affect your body’s ability to reabsorb fluids from within your system. It is EXTREMELY important that your compression garment(s) is (are) worn at all times during your flight. Also, wait to take off your garment until a few hours after your flight. Keep in mind that routine rest and exercise are crucial for keeping swelling at bay. Driving – Take time before your trip to become familiar with the route you will be taking. It is INCREDIBLY important for you to stop periodically and take a few minutes to move around and do a few exercises. Also, take into account direct sun that may be directly hitting you. It is best to wear sunscreen daily and always have protective/cover up clothing available. Be aware of excessive daily travel. Do your best to break up long periods of driving with long periods of rest that include exercises and elevation of your affected limb(s). Lymphatic Drainage Massage is a profoundly effective technique to help increase the body's natural flow of lymph by increasing lymphatic circulation through the body's natural filtration systems. This increased circulation assists in detoxifying the body and supports our health through a better functioning immune system. Lymphatic Massage has been proven to be helpful for clients suffering from lack of energy, a sluggish immune system, emotional stress and depression, sports related injuries and cases where auxiliary lymph nodes have been removed.